What goes into search engine optimization (SEO) for a website? There are a lot of moving parts – some of which come in at the planning and building phase but most of which are ongoing, long-term efforts post-launch. The art of being found on Google is a science that takes many steps. The first is to identify the keyword phrases that your audience will use for search. These should be phrases such as "Philadelphia PA marketing firm" and can even be questions such as "what is search engine optimization for a website?" You may be able to do this based on your knowledge of your audience and your product, but research will help you know what they are really searching for – rather than just assuming you know. When we perform this task for clients, we use online keyword research tools. There are two main approaches to help your business appear on Google. 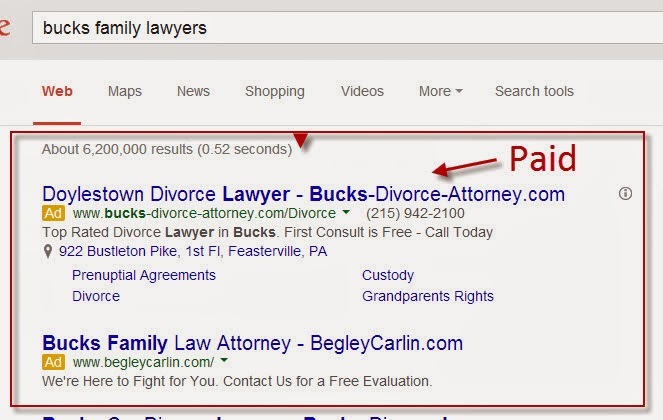 You can pay for placement at the top of a search result page. These are the links that show up in the yellow area at the top of a Google search results page and on the right hand side bar. “Organic” search results require a concerted effort over time to make a difference in search engine results. There are many factors that go into having Google see your website as a valuable site but the most important thing is good, relevant and useful content for your audience. A blog helps support this, but you need to be thinking constantly about the keyword phrases you are incorporating into the body text on the site as well (among other things). The paid approach is instantaneous. However, its results also end after the paid contract expires. The organic approach is a long-term investment that takes time and effort. Furia Rubel does not recommend the paid approach unless you have already thoroughly invested in the organic approach first. Review and improve your online profiles at Google Maps and Google Places. Set up a Google+ page for the business. Review and add keyword phrases and information to your firm's social media profiles such as your LinkedIn Company page and your Facebook company page.